Food has a way of reminding us of certain times and events in our lives. One food that always reminds me of spring growing up is Strawberry Bread. My mom would always make this recipe, that was a recipe of one of her aunts who has some amazing dessert recipes that are floating around in the family recipe book that I would love to obtain! This bread is moist and sweet with hints of spice from the cinnamon. Because it uses frozen strawberries it can be made any time of the year, but the flavors will always remind me of the springtime. And, I will always eat this bread the same way - sliced with a spread of softened butter. 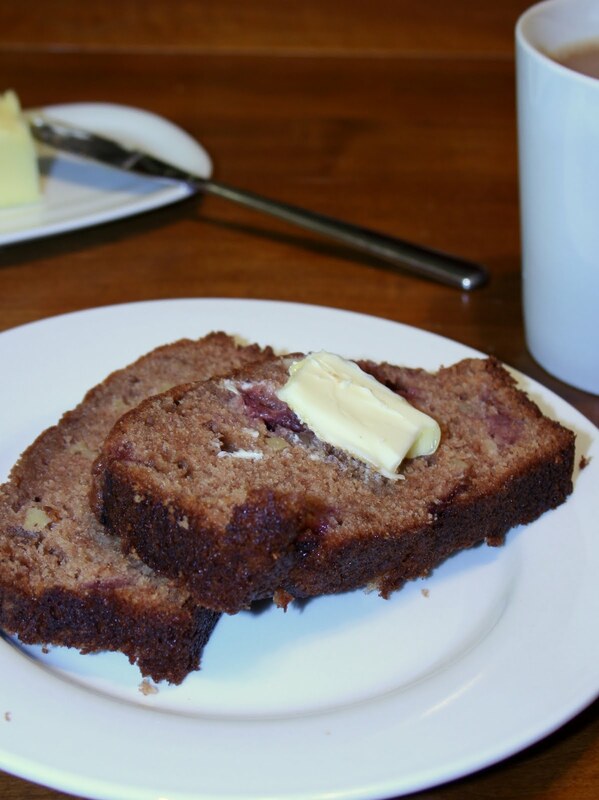 It is good on its own, and I bet it would be good with a little cream cheese but simple butter will ALWAYS be my favorite way to enjoy this sweet and spicy quick bread. Preheat oven to 350 degrees. Grease and flour two 9x5" loaf pans. In a medium bowl, stir strawberries, eggs and oil. In a large bowl whisk together flour, sugar, cinnamon, baking soda, salt and nuts. Add wet ingredients to dry and stir until just blended. Divide batter in to prepared pans. Bake for about 1-hour, or until toothpick inserted in the middle comes out clean. Allow to cool 10 minutes on wire rack. Turn loaves out and cool completely.